Far-Flung Places | Eating well, with creative recipes, to follow the Fasting Lifestyle according to Michael Mosley's "Fast Diet." Been on vacation but wish it hadn’t ended? Haven’t gotten away yet? At least you can eat as if you were somewhere else! The breakfast is from the Basque Region of southwestern France. The dinner is from China. Feast, dream, be healthy. This recipe, comes to us from Saulte to Healthy Cooking, published by the French Culinary Institute. Wonderful book from which we cook all year long. Note that this is a baked omelette, so the method is a little different. Faites bien attention. 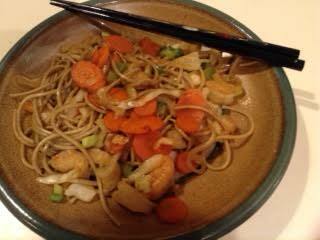 Shrimp Stir-fry with Soba Noodles: 275 calories The back of a bag of udon noodles supplied this recipe and then I adapted it. Cook noodles in a quart of water about 4 minutes. Drain and set aside. Meanwhile, shell the shrimp and cut in half crosswise. Peel the carrots and slice. in a cast iron pan or wok. Add the carrot, cabbage, and onion and stir-fry for 3 minutes. Add the shrimp and any liquid and cook one minute more. Toss the cooked noodles into the pan and mix to warm them. Add , salt, pepper, and soy sauce. Toss to mix ingredients. If you think this sounds complicated and long, I did it in 25 minutes and that included peeling carrots and cleaning shrimp. Satisfying and good to eat. If you don’t like shrimp, substitute just under 2 oz sliced chicken breast.